With double-conversion topology for constant power conditioning and up to 93 percent efficiency, the Eaton 9PX3K3UNP1 model support your overall goal of business continuity. It’s built for scalable deployment, features a graphical LCD for local status updates and integrates with virtualized environments. 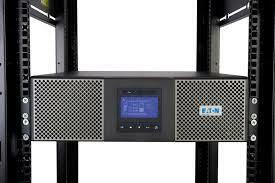 For more information on any Eaton 9PX Online Rack/Tower UPS, call 800-876-9373 or email sales@power-solutions.com.